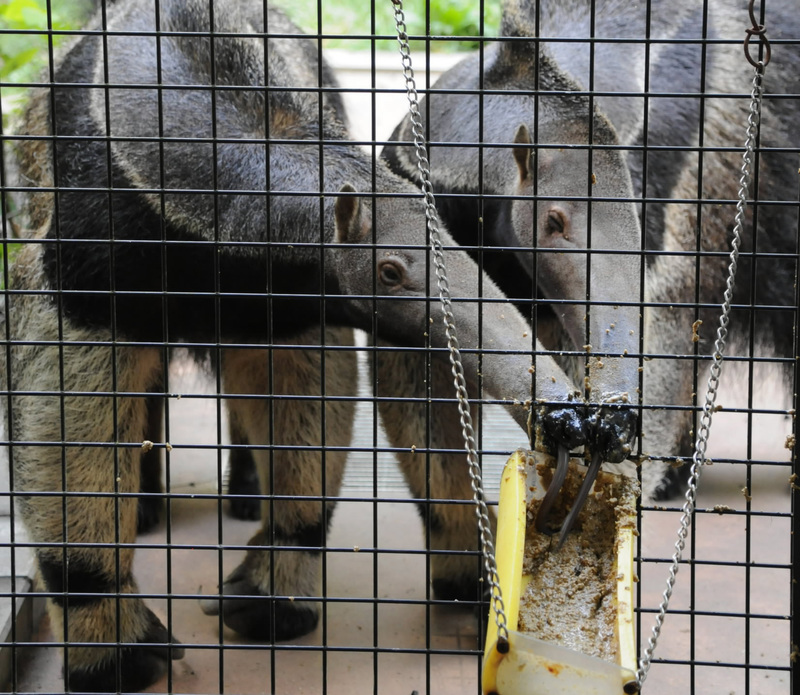 The Higashiyama Zoo and Botanical Gardens in Chikusa Ward, Nagoya, has the largest number of giant anteaters. But few know the anteaters rarely get to eat their favorite dish. “Hey, they are not eating ants!” a visitor exclaimed, watching the animals extend their long tongues from their cage to lick food paste from a bucket. This pasty substance is made of water mixed with pellets that contain beans and chicken meat. “The visitors are often surprised when they see what they eat,” said Azusa Takeda, 31, who takes care of the anteaters. Native to Central and South America, giant anteaters traditionally hunt for anthills and can eat up to 30,000 to 50,000 ants per day. However, it is extremely difficult for the zoo to acquire so many ants each day. The zoo can purchase frozen ants, but they cost roughly ¥5,000 per kilogram and are considered a luxury food. So zoo staff researched procedures at other zoos around the world before settling on their current feed, which costs ¥700 per kilogram and provides a more nutritional balance than ants. 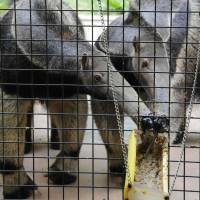 It’s also easy for anteaters, which don’t have teeth, to eat. Nonetheless, the zoo throws them a chunk of frozen ants once a week. “If we put it in a PET bottle and give it to them, they will extend their tongues and lick them with relish. 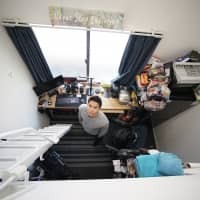 I feel bad that we can’t give them more,” Takeda said. Sometimes, zookeepers happen upon a rotten tree in the zoo’s forest that is likely to contain ants and give it to them. Anteaters aren’t the only animals there that have to make do without their favorite dish. 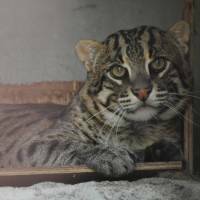 Fishing cats, originally from South Asia, are given horse and chicken meat instead of fish because they are easier to get. They are named for their ability to catch fish from the edge of the water. The zoo used to set out a bowl of water filled with live crucian carp so visitors could see the fishing cats in action. However, the cats began to urinate in the bowl, so they stopped the activity two years ago for hygienic reasons. Since then, they rarely eat fish. 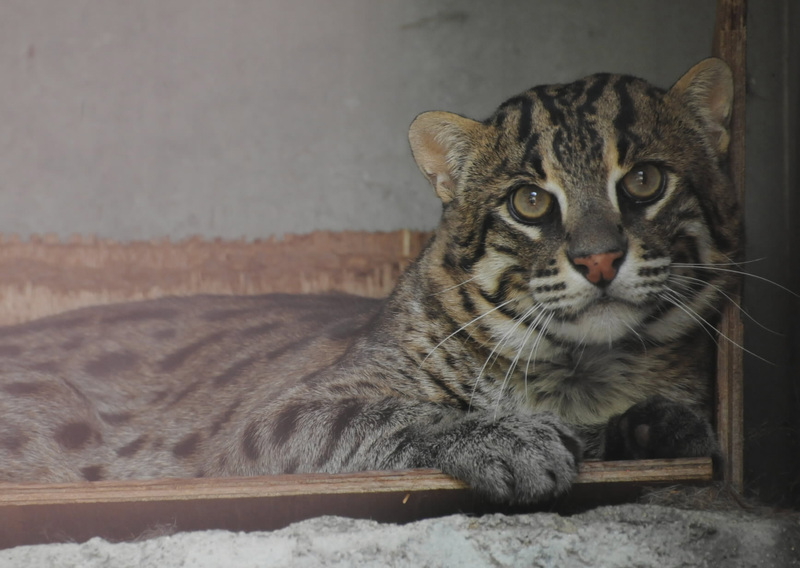 But fishing cats also eat snakes, birds and small rodents. The two fishing cats — one male and one female — in the zoo always finish the food they are given. The male has a particularly large appetite and his stomach is noticeably bigger. “I’ve reduced his food and I’m working to alleviate his metabolic syndrome. It may be better to get him to fish again as a form of exercise,” said his caretaker, Tokuji Hashimoto, 50. This section, appearing Tuesdays, features topics and issues from the Chubu region covered by the Chunichi Shimbun. The original article was published on Sept. 23.